I was introduced to Roxanne Messina Captor a few short months ago by photographer, Joy Daunis. I knew I liked Roxanne right away as she was very personable, humorous and most importantly (perhaps) a fan of one of my favorite spots, the Catalina Coffee Cafe in Redondo Beach. Now that is a friendship in the making! It was very apparent from the beginning of our meeting that we had much in common. Starting with both being educators. Also, our love for film. I as an aficionado and Roxanne as a consummate filmmaker. However, it is her compassion to help women veterans that made me want to learn more about her projects and introduce them to others, like you. Homecoming: Veterans, Wives and Mothers is a poignant and spirited short film in the making. Telling the stories of women who return from active service, the film follows their re-entry and the challenges they face. From PTSD to unraveling relationships, “Homecoming” is raw and tugs at the heartstrings. To make this film come to the screen, many hours have been donated by writers, videographers, editors and more. Sidenote: The film is currently seeking donors for it to be completed. Watch the sizzle real for Homecoming. The “sister” film of “Homecoming” brought to you by Roxanne and Messina Captor Films is Deployment. This film is the opposite of Homecoming, as it shares the story of a woman from the LGBT community who is about to enter active duty. The part that really made my heart sink was when she said good-bye to her brother. Oh the tears come easily during that scene! Soon to be in production is PEARL – a film about the legendary Pearl S. Buck. Roxanne is very dedicated to bringing the story of this humanitarian who’s work continues to help children and their parents. 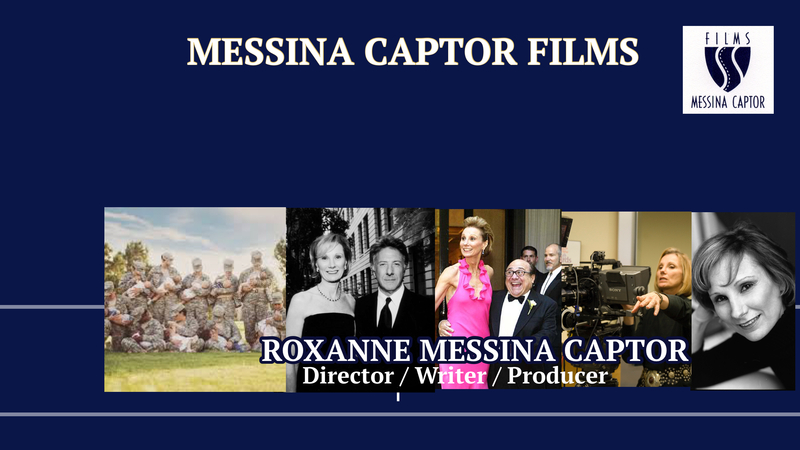 There is much more to learn about Roxanne Messina Captor, including her catalog of more films, webseries and much more! I invite you to her website, RoxanneMessinaCaptor.com . Check out the upcoming film class to be taught on UDEMY and the Photo Gallery where you can spot her in photos with the likes of Francis Ford Coppola, Clint Eastwood, Shelley Long, Dustin Hoffman and many more recognizable names and faces from Hollywood and beyond. I hope you have time to grab a cup of coffee and take a minute to discover the work and genius of Roxanne Messina Captor.